Most types of political engagement are equally commonplace among Americans of different generations. There are only modest age-related differences when it comes to getting involved in political groups or in-person activities, speaking out publicly in online spaces, or speaking out publicly in offline spaces. Social networking sites (SNS) stand in contrast to these other venues. 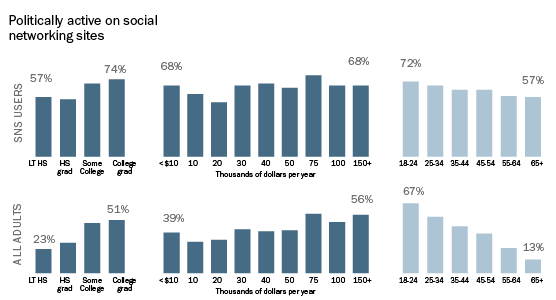 Political engagement on social networking sites is especially commonplace among the youngest Americans, as two-thirds (67%) of all 18-24 year olds (and nearly three quarters of those young adults who use social networking sites) engaged in some sort of social network-related political activity in the 12 months preceding our survey. Indeed, the youngest American adults are more likely to engage in political behaviors on social networking sites than in any other venue. Older adults tend to be fairly politically active on social networking sites to the extent that they use them, but are relatively unlikely to use these sites in the first place. So, although nearly six in ten SNS-using seniors are politically active on these sites, that works out to just 13% of all Americans in the 65+ age group.